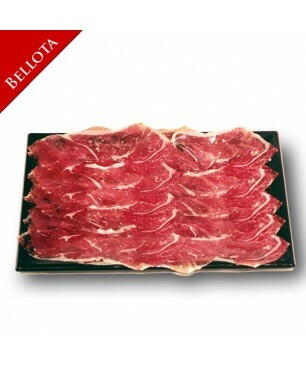 The sliced Iberico Bellota ham tray is the maximum Spanish ham sliced on a tray. It is a tray, low pressure vacuum-packed. This way the ham is not squashed and can be opened and served directly on the table. You can store it for some days on the fridge. Beautiful presentation for a dinner with friends, a family reunion or a birthday party. 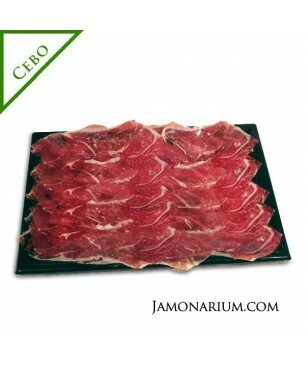 The sliced Bellota Iberian Spanish shoulder ham tray is a delicious "Iberico" shoulder ham sliced on a tray. Low pressure vacuum-packed tray. This way the ham is not squashed and can be opened and served directly on the table. You can store it for some days on the fridge. Beautiful presentation for a dinner with friends, a family reunion or a birthday party. The cured sheep cheese Tomelloso produced with raw sheep milk.Yellowish paste overwhelming and intense flavor and characteristic of sheep milk and its long maturation. 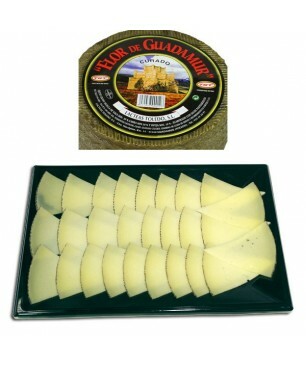 The cheese Flor de Guadamur is made with pasteurized milk from cows, goats and sheep and comes from Toledo.